Form factor: 1U rack serverProcessor: Intel® Xeon® Processor E5-2678 v3 x 2Memory: 128GB DDR4 (16GB ..
Form factor: 1U rack serverProcessor: Intel® Xeon® Processor E5-2650 v3 x 2Memory: 64GB DDR4 (16GB x..
Form factor: 1U rack serverProcessor: Intel® Xeon® Processor E5-2620 v3 x 2Memory: 32GB DDR4 (16GB x..
Form factor: 1U rack serverProcessor: Intel® Xeon® Processor E5-2603 v4 x 2Memory: 16GB DDR4 (8GB x .. In today's business environment, staying proficient in IT server and computers equipment is usually a essential need for company who desire to be competitive in the marketplace. Many Small businesses make use of cloud computing services to avoid the purchase of equipment to fulfill their demands. However, there are also many purchasing an in-house server which bring a lot of benefits such as securing your own network and increasing confidential data protection. 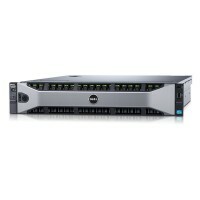 Dell, HP and IBM / Lenovo server are the popular choices for a small business. Dell server is reliable, cheaper and come with awesome support, HP server uses a stable hardware and does not party out servers every three months and IBM / Lenovo server often has a leading edge technology with fewer whistles and bells. You may find either Intel based or AMD server from these server depends on your needs in Singapore. At Precomp (Singapore) Pte. Ltd , we offer full range of IT hardware equipment as well as a pool of skilled engineers and computer technician which are ready to provide substantial service in your business at Singapore. Our range of products including various types of HP & IBM servers, Workstations, desktops, laptops, UPS, storage and server racks that specially design to Dell, HP and IBM server. Do check our products via the categories listed below. Apart from that, we have a team of professional experienced engineers that offer system deployment, system updates, running diagnostics, workload migration and hardware configuration to our clients.